(LWI) - In Angola, farming communities are vulnerable to losing their land. Foreign investment presses its way into the country, endangering small scale farming and authorities offer little protection. LWF raises awareness through workshops on land rights and administrative procedures, and offers literacy classes for adults, to help people protect their livelihoods and claim their rights. Eduardo C. (name changed), 53, used to cultivate a plot by the river in Moxico province, eastern Angola. One day he saw a fence had been erected, cutting his land off from the river. The soba (village leader) told him his land had been leased to a private investor from the capital, Luanda. Eduardo had no choice but to move to a different area without river access or irrigation. “The private investor had already paid and signed all the papers when I learned about it,” Eduardo said. 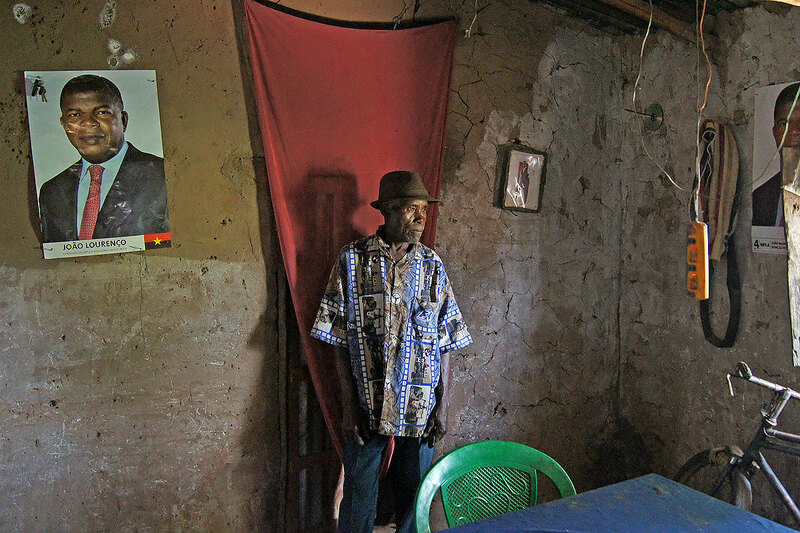 A farmer in his house in Moxico province, Angola. Like many others, he is a strong supporter of the ruling party and the president, who is depicted on the posters. Large land occupation and grabbing cases like these are happening in various places in Angola, a country rich in natural resources, such as diamonds and oil. When the oil price dropped, the government decreed a diversification of the economy, encouraging investment in agriculture from foreign as well as local companies. “The government is encouraging diversification of the economy, but the problem is that often the legal procedure is not respected,” says Malungo Germano, LWF Advocacy Officer in Angola. Suddenly, private investors, many of them high-ranking government officials, become interested in land which has been farmed by communities for generations. They are often acting in the interest of foreign investors. The communities in most cases find themselves on the losing end, despite a new land law which was put into place to protect their interests. “Angolan land law decrees that community land cannot be sold but the community can grant the use of the land to an outsider,” explains Calucango Caseno Sabino, LWF Community Lead Justice and Peace Officer. The community needs to be consulted before a decision is made, Sabino adds, but that is seldom the case. “Instead, the traditional village leader uses an authoritarian approach in decision-making,” he says. However, an element of power imbalance exists when authorities in a highly centralized government visit a local village chief. Lack of knowledge or illiteracy prevent the farmers from learning about the situation until it is too late. In a village play, farmers tell the story of how an investor convinced a village chief to give him land. The role of the village chief is here played by the soba himself (sitting, middle). In many cases, bribes have been passed - incentive payments, boxes of wine. In Bernardo’s village, the soba became the manager to the same investor to whom he had leased community land. “I consider him a friend,” he says, without having any sense of wrongdoing, while farmers from the village loudly voice their discontent. Like in this community, land grabbing starts to threaten not only livelihoods but also the social peace. LWF staff have witnessed many such cases corruption.Therefore, LWF focuses on empowering the community. In workshops, communities learn about the land law and their rights. They learn to organize themselves in village development committees, which provide a stronger basis from which individuals can challenge decision or discuss matters with authorities. Literacy classes for adults enable communities to read official announcements and understand the law. A large number of participants are women, who are starting to take the initiative in securing the land and protecting their family income. 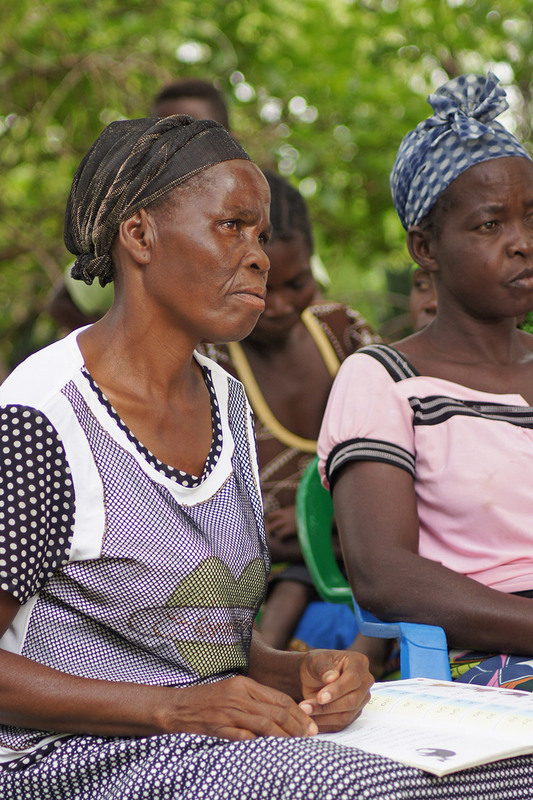 Literacy classes and workshops on land rights enable women and men to better interact with authorities and to claim their rights. LWF also works with local authorities and village leaders, inform them of their rights and obligations to the local communities. “The problem is that many community leaders are not aware of land law,” says Cahilo Chijica, sectorial head of agriculture and rural development in Moxico province. “They do not know that the land cannot be sold.” To him, LWF is a valuable partner for him, not only in educating communities but also for local authorities. Workshops with administration educate civil servants on how to best inform people of their rights, and at the same time are a reminder of their obligation to do so. The problem is that many traditional leaders are not aware of the land law. They do not know that the land cannot be sold. LWF not only advocates with local and national authorities but also takes cases like that of Eduardo to the international level. Land grabbing and loss of livelihoods are important indicators of the country’s human rights record, as defined by the UN Human Rights Council. The UN can then put pressure on national governments to better protect communities. A couple which has been driven from their land, on the plot where they farm cassava. 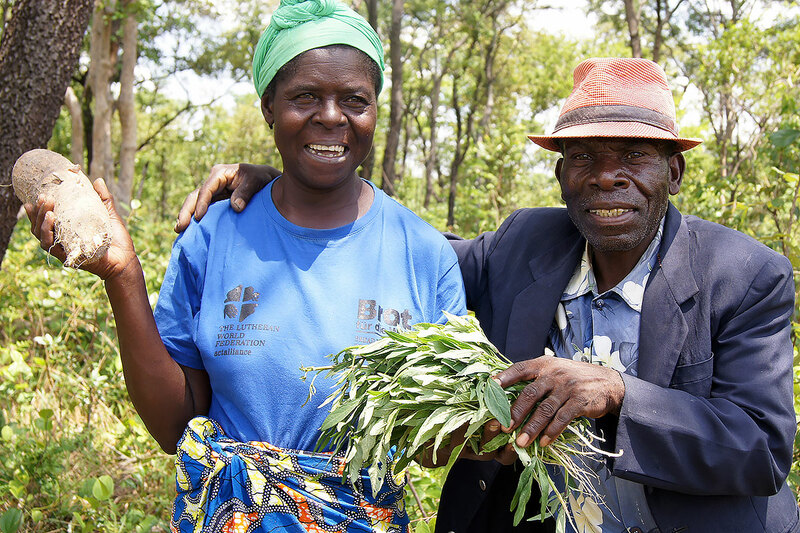 With support by LWF, they have started to employ all legal means to get their land back. 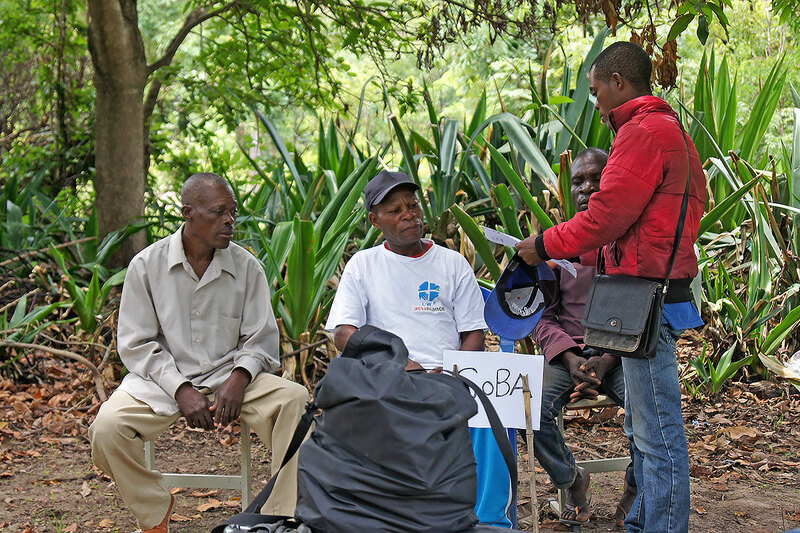 In the little village in Angola, Eduardo will not get his land back – yet. The soba, however, has made a commitment in front of the entire village to try and rectify the situation. “The next time the general comes here, I will tell him to stop exploiting the land, because it belongs to us,” he promises. LWF work on land rights in Angola is funded by Bread for the World.